In the process of sifting gravel and wandering through the woods in search of fossils, it is only a matter of time before one has the pleasant surprise of stumbling upon an artifact. The point was found by Steve and Mary Ann and the small section of colonial pipe stem, while not impressive, is my first colonial artifact. I've turned to the expert, JP on these two finds, and he came up with some rather interesting information. If you have not seen the pictures of JP's Indian artifact collection yet, I've included a link at the bottom of this page. "In general, the earliest paleo era and early archaic points were made out of high quality materials. 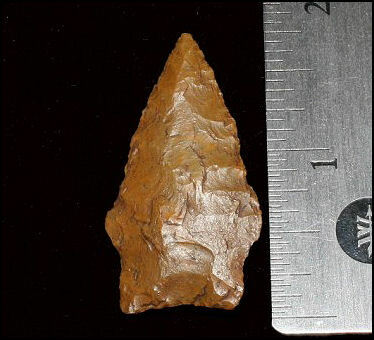 As the archaic period progressed, and this was 5 or 6 thousand years, local lower grade lithic materials were used for most points. This is the argillite, rhyolitte, quartzite time frame. Then, at the end of the archaic, higher quality materials were again used. Early Archaic 8,000 - 6,000 years ago. 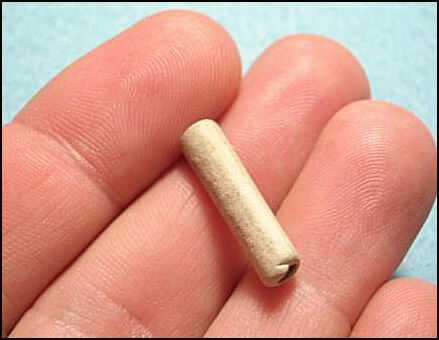 Section of colonial clay pipe stem. 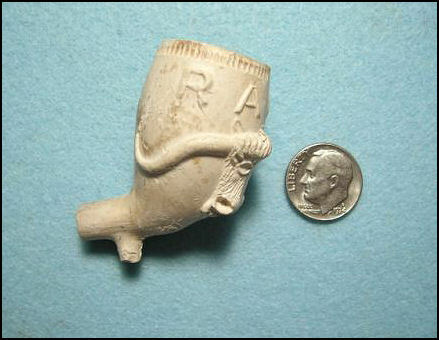 Bowl from a colonial pipe. This was purchased a while ago and I've included it just as an example.